How secure is your home? Even if you live in a safe neighborhood and don’t mind leaving your front door unlocked every now and then, home security is an area that homeowners are looking for when on the home search. Here are the four main areas to keep on your radar when it comes to home security. When it comes to ensuring home security around your front door, there are a few easy measures you can do right now. First, move your spare key out from underneath your flower pot, inside that faux rock or any other obvious spots and to another location. Or, you might even forego having a spare key by your front door and instead leave it with a trusted neighbor. Next, assess your locks. If you don’t have a deadbolt or a new kick plate in place, install these into your front door for greater security. Other items to consider to further security around your front door are a digital keyless door lock or a door alarm. Your first floor windows are your most easily accessible windows of your home. For home security purposes, there are plenty of ways you can ensure they’re more secure now than ever. The basics include having curtains, which block the view of intruders to see inside. For even extra protection, add blinds—in addition to curtains—to make it completely opaque from the outside. Upgrading your windows to a more durable material, such as polycarbonate, is much stronger than the standard glass windows and will not break as easily. Of course you can also attach alarms on all of your windows to alert you when they are opened. 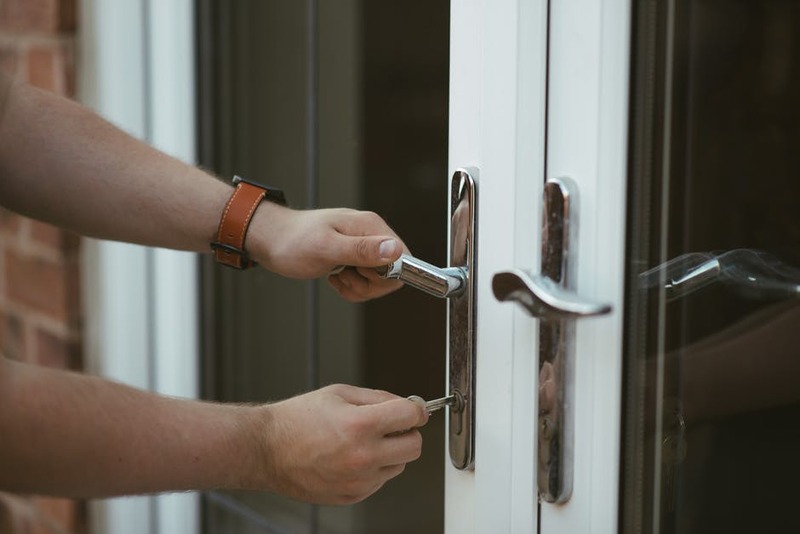 From your back door going out to your backyard to your garage doors and storage shed doors, there are plenty of other doors that might not be on your home security radar. Since these doors are often more out of view and are less enforced, this makes them an easy target for your security to be breached. To better reinforce the secondary doors of your home, change the locks to newer ones or use a keyless lock. And just like you would for your windows, cover these doors with blinds or curtains. Do you have any shrubs flush against your home? You’re not the only one. While these make lovely additions to your landscaping, they are also hidden areas that intruders could hide in around your home. Ensure these areas are exposed by installing lights around your home. You can also make sure these areas are trimmed back so that they cannot be used for hiding. For extra security, you could install motion lights in these areas to turn on whenever there is movement.